Urban farming is hard, but it gets easier when you can put it all inside, like they’ve done in the food desert of Bushwick. Now there is fresh lettuce for everyone. The less money you have, the more likely it is that you live in a food desert, or a place where affordable and healthy food is difficult to find. Child Development Support Corp., a social service agency in Brooklyn, New York, is taking a small–but significant–step towards changing that. Led by Mireille Massac (she runs CDSC’s food pantry), the agency has built a 250-square-foot indoor hydroponic farm that grows basil, bok choy, collard greens, and multiple varieties of lettuce. Food pantry clients now have an alternative to the canned vegetables and unhealthy foods they usually end up eating. “Every week we have fresh produce for clients,” says Massac. The idea for a hydroponic farm came after CDSC started participating in Local Produce Link, a United Way program that allows food pantries to get fresh organic produce from farmers in upstate New York. Each farmer delivers produce to a selected pantry. The program worked well for CDSC; the organization began educating clients about organic vegetables and food preparation, and they loved it. There was just one caveat: Come the winter months, Local Produce Link had nothing to offer. A member of CDSC’s board suggested hydroponics as a solution, and it wasn’t long before Massac met up with Lee Mandell, owner of Boswick Farms in Bushwick. “When I heard that someone had a farm in Brooklyn, I was like ‘What?’ The farm was in [Mandell’s] house. He showed all these different things he was growing, and gave myself and some interns a workshop. We thought, ‘We can definitely do this,&apos;” says Massac. And then Massac had an idea: she applied for a funding from a United Way urban farming initiative. “I never applied before because I didn’t have land, and this was not what they were traditionally funding,” she explains. But CDSC did, in fact, get a $24,000 grant, and the agency started planting last March. By May, they had a small harvest. Now CDSC can offer organic vegetables to all of the 125 clients that come to its food pantry each week. Unsurprisingly, the idea is starting to catch on. 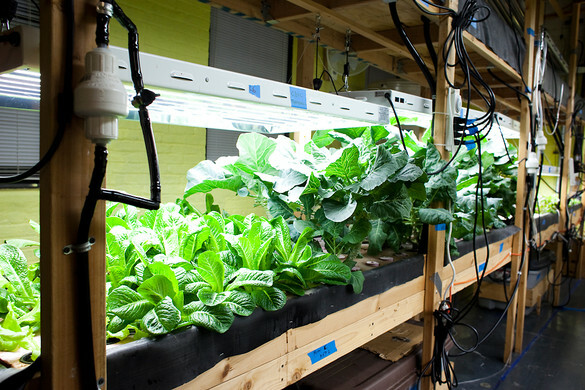 Los Sures, another social services agency in Brooklyn, is in the process of building a 400-square-foot hydroponic farm. Massac says that people have started coming to CDSC just to see the farm.